Looking at all courses part-time faculty respondents reported on, the median pay per course, standardized to a three-credit course, is $2,700. There does appear to be a wage premium based on credentials among part-time faculty members: those who hold a bachelor’s degree earned a median pay per course of $2,250, those with a master’s degree earned $2,400, those with professional or other terminal degrees earned between $2,800 and $2,937, and those with a doctorate earned $3,200 (table 19). This wage premium, however, reflects differences only within an employment category that is significantly underpaid, not just in comparison with tenured and tenure-track colleagues but also in comparison with similarly credentialed workers across the United States in all professions. 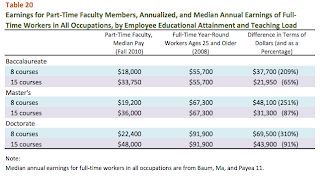 If we were to annualize the median per-course salaries of part-time faculty respondents and compare them with the median earnings of all full-time workers, it becomes clear just how underpaid this group of professionals is. We first annualized pay based on an annual load of eight classes that might be configured in more than one way (i.e., four courses in each of two terms during the traditional academic year, or three courses in fall and spring and two courses in the summer [table 20]). 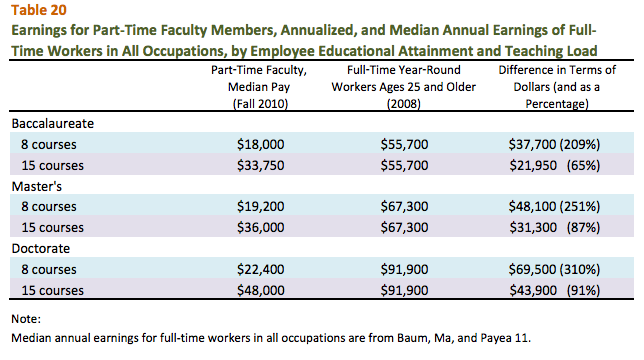 The gap between what a part-time faculty member earns and the median earnings of full-time, year-round workers of equivalent educational attainment is staggering and becomes more dramatic as the level of credential rises. Some would assert that while eight courses per academic year might be considered a full load for full-time tenure-track faculty members, such a teaching load without any research or service requirements does not truly represent the work of a full-time faculty member. Others would assert that, regardless of outside work, an annual course load of eight courses does not reflect fulltime employment. Even if we annualize salaries using an extreme model of a teaching load of five courses in each of three terms during a year, however, we find that the annualized earnings of a part-time faculty member are still dramatically below that of professionals with similar credentials (table 20). For most Americans, higher educational attainment regularly and predictably leads to higher earnings. The wage premium for an advanced degree for part-time faculty members who responded to this survey, however, is minimal and comparatively lower than the median earnings of other professionals with the same level of education. Labels: (sl)ac(k)ademia, education, ethics, in medias res, links, No. The Texas GOP says, "Screw your hypotheses!"